It is a light, soft and tangy mousse perfect as a dessert. Make a puree off the mango and ginger until smooth. Keep a side. In a bowl, whip the cream until it forms soft peaks. Into the whipped cream, carefully fold in the mango mixture until fully combined. 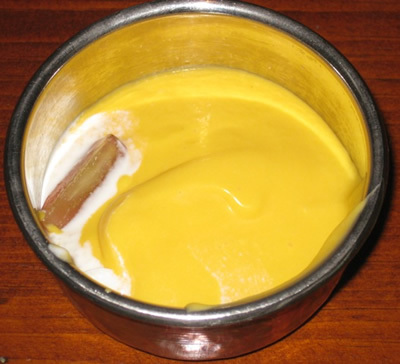 Dissolve the gelatin in water and gently pour it into the mango and cream mixture. Mix well and leave to chill in refrigerato for 30 mins. Whip the egg white in a clean bowl until they forms peaks. Beat sugar into the egg white and gently fold it into the mango and cream mixture. Decorate with chopped mango and ginger.